When the bell rang to begin the seventh round of the heavyweight championship of the world that long-ago February day in 1964 in Miami and a battered Sonny Liston, slumped on a stool in his corner, spat out his mouth guard instead of standing up, it was the ridiculed long shot, Cassius Clay, on his feet, ready, who realized first, a moment before anyone else, what had just happened. Shooting his arms into the air in triumph, his mouth a wide ‘‘O’’ of joy, he managed a brief victory dance alone in the center of the ring before pandemonium erupted and the world came over the ropes to embrace him. And so he was, for one more day as Cassius Clay, then for decades as Muhammad Ali, the only man to win the title of heavyweight boxing champion three times, a reign interrupted in 1967 by his refusal to be drafted into the U.S. Army, a moral stand that stalled his boxing career and deprived him of the fortune he could have earned during three years in his prime, but cemented his fame as a revered cultural icon. An eloquent summary of an extraordinary life. An amazing career, well told. I think that at the time I didn't appreciate the sacrifice Ali made for his beliefs. I too took a stand against the Vietnam War, but my stand was far behind the front line and my no means vocal. I don't envy him his fame, his riches, his enduring legacy, but his integrity in the face of unremitting and virtually universal opposition, of that quality I'm jealous. Thanks for this. My first memory of Ali was a negative one; I was young and didn't quite understand why people I knew seemed to hate him, not knowing much about him myself. Of course, those early beliefs couldn't have been more wrong. The most important athlete in our history, no doubt. The man was a fighter in every sense of the word. 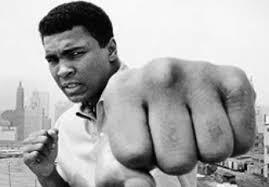 His victories in times of civil strife and war showed a strength of character beyond the strength shown in the ring. Lovely summary. As you say... "without question the most significant athlete who ever lived." And so much more.